Why do my different bottles of CA have slightly different colors or hues? The slightly different colors and hues come from the stabilizer used in the manufacturing process. This chemical has a fairly wide color window (20aspa to 150aspa). Mercury typically sees around a 30aspa to 50aspa, which for the most part would be colorless, the spec or tolerance can go as high as 150aspa, which would still be in spec and be a slight amber color. UV light can also have an effect on the stabilizer, causing an oxidation of the stabilizer, which would increase the aspa spec for that particular bottle. Note that his color difference or oxidation of the stabilizer has no effect on the stability or the performance of the product. Mercury has performed accelerated and real time testing on all Mercury products to the point of actually exposing them to enough UV light to oxidize them to the point of turning brown with no loss in tensile strength, set times, or increase in viscosity. What are threadlocks and how do they work? Threadlocks are anaerobic adhesives, this means that they cure in the presence of metals and the absence of oxygen. To use threadlocks you simply apply them to the threads of a bolt and tighten the bolt. Once the threadlock comes into contact with the metal bolt and the oxygen is removed during the tightening process it will cure on the threads and prevent the bolt from loosening. Mercury M68DB Debonder is a solvent, typically acetone based that dissolves dried up CA. It can also be used carefully to separate 2 parts glued together with CA. Why are some substrates more difficult to bond then others? Not all substrates are created equally, some substrates, like foam have very low moisture content. Some substrates like light-ply have high alkaline content. Foam, with its low moisture content can be very difficult to bond, often requiring the use of accelerator. 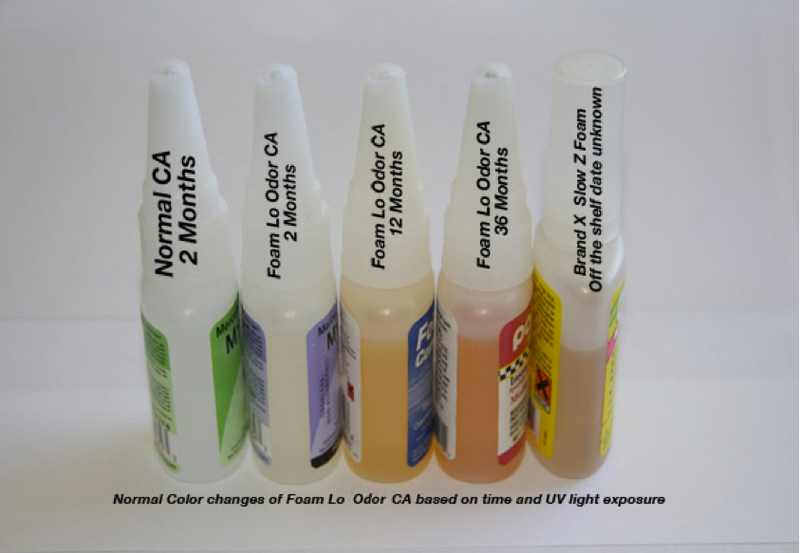 Light-ply, with its high alkaline content, can be very difficult to bond because alkaline is a neutralizer to CA which makes it very non-reactive. In the case of light-ply the use of an accelerator or our M100XF High Performance CA can be used. M100XF has been specifically formulated to handle the high alkaline levels in some woods giving the same speeds and strength without the use of accelerator. 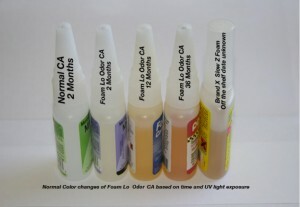 Some plastics like polyolefin’s can be very difficult to bond and may require a primer be used before applying the CA. Does the use of Accelerator compromise the bond of CA? Depending on the type of accelerator and the amount of accelerator used yes accelerator can compromise the bond. Typically accelerator shocks the CA into curing causing a more brittle joint. In some case the CA can be shocked so violently that it will actually foam up introducing air into the joint. Accelerator should never be used with thin CA and there are times, if used properly (like making fillets or filling gaps) it is perfectly acceptable to use accelerator. If accelerator is used always use it sparingly. Mercury Adhesives accelerator has been formulated to be a bit less aggressive so as to not shock the CA but simply speed up the set time needed. The most common use for accelerators is to help with hard to bond substrates. The Mercury MH16 Accelerator is a solvent that is used to speed up the cure of CA. It typically is one of three base ingredients, Alcohol, Heptane, or Acetone. Alcohol is the least aggressive and most substrate friendly product. Heptane is a very good all purpose accelerator as far as speed and substrate compatibility goes. Acetone is the most aggressive and least substrate compatible product. Most available accelerators are either Acetone or Heptane. Mercury uses a Heptane base with proprietary additives to give us a nice blend between speed and aggressiveness. Our accelerators are foam compatible as well. What is blooming (or all this white stuff)? The phenomenon known as blooming is when the CA vapors leave a white haze behind after curing. This is typically caused by a couple of things. Too much adhesive is used, too much accelerator is used, high humidity environment, and improper ventilation around the part while the CA cures. If an excessive amount of CA is used you will get excessive gassing during the cure process which will cause blooming. If accelerator is used in excessive amounts it speeds the curing process up so dramatically that you will get a large amount of gassing during the curing process causing blooming. The excessive moisture associated with high humidity acts just like using too much accelerator. Improper ventilation during curing will allow the vapors to build up on the surface and cause blooming. Blooming is strictly a cosmetic issue and has nothing to do with the quality of the bond, if blooming cannot be tolerated at all than it is good to use a low odor product that will not gas or bloom. Why does the nozzle on CA bottles always clog and how can I keep them from clogging? Some companies have claimed to have a clog free nozzle, which in reality is only a very long nozzle that you keep snipping the clogged end off until there is no nozzle left and still end up throwing it away. Other companies simply sell you extra caps and nozzles so you can replace them after they clog. Mercury Adhesives has actually engineered a nozzle that not only will not clog but has 3 different points of seal to assure the product inside is kept fresh and away from moisture. This cap has a blunt nose, stainless steel pin molded into the cap, which engages into the orifice of the nozzle (not scratching the insides of the bottle) to keep the orifice clean. Inside the tip is a calculated venturie shape, which pulls the CA out of the tip and back into the bottle once the bottle is stood upright. On the very tip of the nozzle is a tapered seat which engages with a tapered boss in the cap creating compression on the tip of the nozzle keeping the nozzle clean and the product inside fresh. If the cap is replaced each time the user is finished with the product the nozzle will never clog. There are only a handful of actual manufacturers of Cyanoacrylate in the world. Manufacturing CA is a very involved, complicated and expensive process. While it is true that there are “re-packagers” of CA in the USA, there is only one true manufacturer. Mercury Adhesives products are specially formulated and manufactured in Georgia where over 2 tons per month are produced with in-house reactors. All the other products sold in the hobby market are made overseas and are some times industrial remnants sold to the highest bidder and then shipped into the US in bulk for re-packaging. The problem associated with shipping CA from overseas is simply the time lines it takes to produce the products, package the products, and ship them to their final destination. Once the products are made they typically sit in totes in a warehouse waiting to be sold, this could be several months in un-controlled environments. Once product is sold it is scheduled to be filled into bottles, typically taking another 30 days, then they are shipped to the US, which takes a minimum of 8 weeks on the water (which by the way is the worst environment for CA). Once they make port they can sit anywhere from 2 to 4 more weeks clearing customs before being shipped to the customer, again all in un-controlled environments. At this point the products are put into another warehouse where they could sit for several more months waiting to be shipped to the retailer who sells to the end user. By the time the products reach the retail shelf they can be as much as 12 months old or older. The only way to assure an acceptable shelf life to the consumer, who purchases this product from the retailer is to over stabilize the product with added chemicals which greatly reduces speed, strength and consistency of the CA. Since Mercury Adhesives are made in Georgia these time lines are reduced dramatically. Being one of the largest producers in the world fresh batches are being produced every day which means that product never sits in totes for more than a few weeks and in most cases product is made to order. By the time Mercury products reach the retailer it is never more than 60 days old, this means Mercury can make a much higher quality more aggressive product since we do not have to over stabilize our products to deal with the long time lines getting product to the retail shelf. This is also another reason why Mercury Adhesives is the only company to offer a 2-year guarantee. CA is extremely strong, it is not unusual to see tensile strengths upwards to 2 tons per square inch! If your old enough you may remember a television commercial where a person is hung by his hard hat, which has been glued to the crane with CA (Super Glue). As strong as CA is in tensile it is considerably weaker in shear or peel forces (These are forces applied perpendicular to the bond line). This is why it is important to understand what forces will be applied to the joint and what the products being bonded can withstand. While CA is not near as strong in shear as it is in tensile a glue joint is only as strong as the substrates being bonded, for example, if you were to bond balsa wood the balsa wood will always break long before the glue joint would fail, no matter what the forces are. Given all the products we presently use in the modeling industry today it is safe to say that a high quality CA like mercury products will withstand any forces the substrates can withstand. This is why Mercury products are so widely used today, they are very fast, very strong and since it only takes small amounts to do any job it is the lightest adhesive available. We want to hear from you. Write, call or email us with your comments and questions or tell us about a project you are working on using Mercury Adhesives for consideration to be featured on our site.